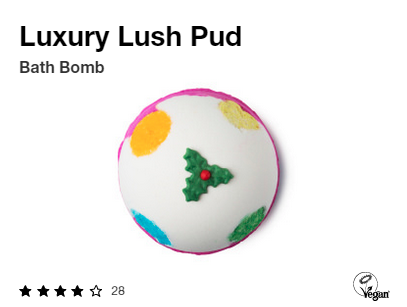 Last night I decided to try out one of the bath bombs I’ve been dying to use since it was released: the Luxury Lush Pud Bath Bomb! Just look at it, it’s the most beautiful thing I’ve ever seen! 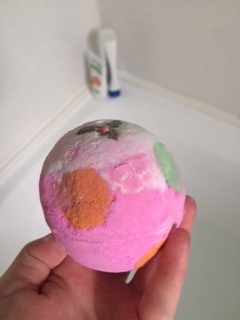 I went immediately to my local Lush store and picked up this little beauty for $7.90. Lush’s bath bombs are on the pricey side initially, but they are definitely good value for money. Lush does not test on animals or use harsh chemicals, and the scent is divine. I have cut mine in half before and used them for two baths, and even using it whole, you get an experience that is definitely worth the price. Basically it has pink, orange, green, white, yellow, blue… All sorts of colours in it! And a very cute holly berry on the top. It’s quite large and hefty, which makes me think slicing it in half would work to stretch it out. It has the same scent as the Twilight bath bomb, which is a combination of lavender, tonka absolute, and ylang ylang to banish stress and tension and promote sleep. I love it, although it may be a little strong for people who like more delicate, less in-your-face scents. In the end, my bath water ended up a reddish pink, which was very pretty to soak in. I have dry skin, and Lush bombs often leave me feeling a bit itchy, but I didn’t even have to moisturise after this one. Perhaps it’s the essential oils in it? I emerged from the bath feeling relaxed, happy, and ready for bed. So all up, I’d give it a 9/10! My only gripe was that, as it’s bright pink, I did get a quite noticeable ring around the tub, and I had to rinse it a couple of times to get it off. I guess that’s the danger of having such delicious goodies in a white bath! Lime Crime Lipstick Swatches + Review!